Helllooooo everybody! 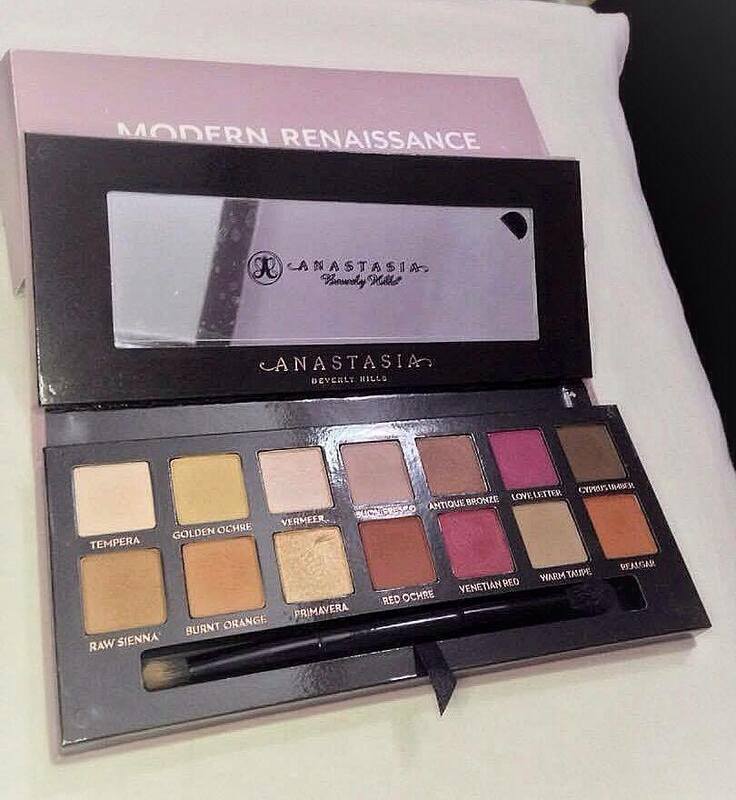 In this post I am gonna be doing a review on this beautiful palette from Anastasia Beverly Hills (ABH). I am starting on this product because this has been my current favorite. 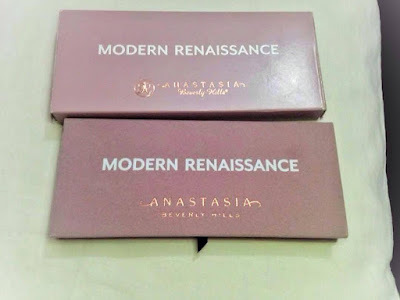 ABH produces good eye-shadow palettes that are mostly raved about. One of them is this Modern Renaissance palette which is most hyped about. This is my first eye-shadow palette from ABH and it definitely lived up to its hype. When I first saw this palette on YouTube, I instantly fell in love with the colors. Maybe I was unsure about getting this palette because I was worried about how am I gonna work on these berry toned shades that are in this palette but I eventually got them after months of good thinking just to see what's all the hype about. So let's see what this palette has got to offer. This palette comes with a light pinkish colour cardboard box cover and the palette itself has a nice velvet-y material which gives off a luxurious look and feeling to it but it can get dirty easily and it can be noticeable. This is why I always keep the palette inside the box to avoid getting it stained. 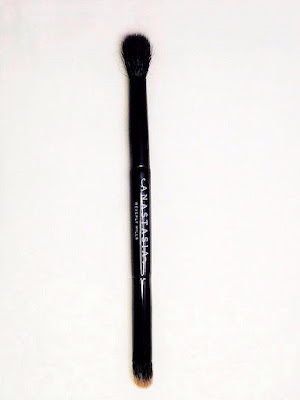 On the inside, the palette comes with a mirror and a double-ended brush (a flat brush and a blending brush). They have listed the names of each shade in a rose-gold embedded font. The material used to make the body of this palette makes this palette not only look pretty but is also actually light which makes it travel friendly. Although this palette is not available for sale in any Malaysia retail store, it is not a huge obstacle that stops you from buying it as you can actually purchase it from Sephora or buy it online via the ABH website with a shipping fees attached to it. However, you can get this palette through any online shop on Instagram that sells authentic make up products just like how I got mine from ShoplikeSurie for RM 215 (excluding postage). Just take note and be aware to get the authentic ones in which obviously the fake ones would be more cheaper than the usual price. If you would like to know how to distinguish between the real one and the fake one in detail, you can watch this YouTube video about it. The palette contains 14 beautiful shades which are extremely pigmented which mean you do not have to use a lot of the product to build up the color and with good pigmentation comes with good staying power. Therefore, a little goes a long way. The palette has 14 eye-shadows that comes in a range from neutral to berry tones. 10 of them are matte shades, 3 metallic shade and 1 satin shade. I personally find these eye shadows easy to blend and the formula/texture of it is so butter-ry. All shades have very good colour payoff as how they appear in the palette. However, I have noticed that this formula creates a fall out on some of the shades as I used them. My favorite shades from the palette are Raw Sienna & Burnt Orange (both are perfect transition colors for me), Tempera & Vermeer (brow highlight), Realger (crease color) and Venetian Red & Love Letter (beautiful berry shades). Personally I will use it with a primer and even with or without, the eye-shadows stayed pretty long on my eyes. It is totally optional to use a primer before applying these shadows but I recommend anyone to have a primer on since it will act as a base for my shadows to stick on to and also prevent my eye-shadows from creasing. This palette is versatile enough to create looks from day to night for any occasions. I think these shades are suitable for any skin color which I find happy about because I feel it is important for the any eye-shadow to look beautiful on any skin tone. I love this palette because of the quality and the variety of shades that you can create depending on your preference together with its amazing quality. This palette has been my go-to eye-shadow palette because it contains pretty shades that pair wonderfully and it is easy to work with. I can go from a day-time neutral look to a smokey-eye later at night. However, I personally do not like the packaging as it gets dirty easily and it's expensive. For those who can afford this I would recommend you to get your hands on this one! So,let me know if you had the chance to grab this palette and what you actually think about it. I would definitely give this product a rating of 4/5 stars!